If you have an Etsy shop, you’ve probably considered also having a complementary website, but aren’t really sure if you need one or not. 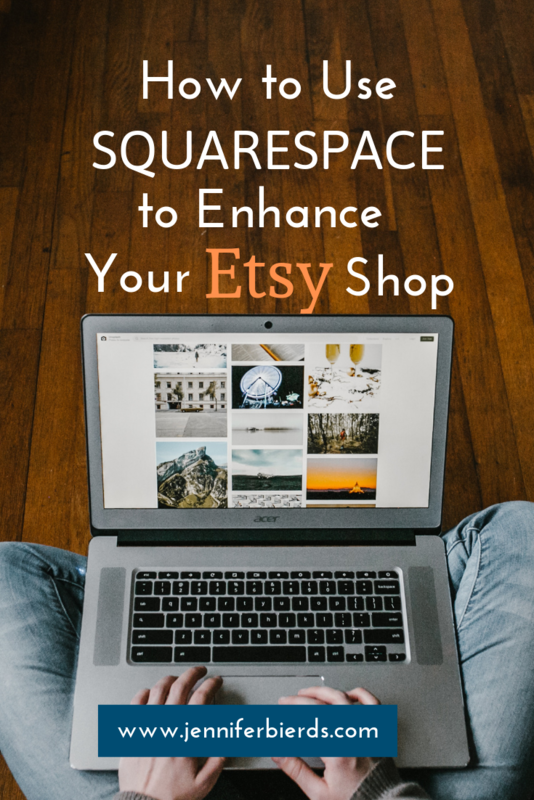 Squarespace is perfectly suited for Etsy sellers! Below, I’ll outline why having a website in addition to your site is a great idea, and how you can take advantage of Squarespace’s features to see success with your shop. Once upon a time, I had an Etsy shop selling children’s floor pillows called Little Boy Howdy. When I started, I was going to sell all kinds of things for little boys, including clothing, floor pillows, and accessories. But, as time went on, I learned what my customers wanted, which was custom floor pillows. My favorite part of this whole business was receiving customer feedback, especially with pictures of their adorable children on my creations! Unfortunately, producing custom floor pillows is time consuming, and not all that profitable, so I eventually closed down my shop. Fortunately for you as an Etsy seller, I learned a lot along the way. When I put a lot of effort into marketing, I saw measurable results in views, favorites, and sales. At the time, I was trying to do #allthethings - Facebook, Instagram, and Pinterest. Since I only had an Etsy shop and no website, I knew that something I was doing was working, I just wasn’t sure what. In the meantime, I was endlessly taking photos and on social media. In terms of dollars per hour, it wasn’t worth it. Now that I have hindsight, I realize I totally needed a website. I didn't need just any website - I needed Squarespace. Because I was busy cutting fabric, sewing floor pillows, stuffing and shipping, I needed a website that wouldn’t cause me more work. I needed a website that would actually help streamline my processes and attract my ideal customers so I could send them directly to my shop, not just hope they’d find me on Etsy. If you’re an Etsy seller, chances are, you could benefit from having a Squarespace website now - don’t wait until it’s too late. Having a custom website makes your shop look more professional, like an actual business instead of someone working on their dinner table (like we’ve all done). You can create the entire design around your brand, and you have an opportunity to tell the story of your business in a completely customized way that will stand out from the competition. Your potential buyers will have more confidence to move forward with a purchase knowing that they’re buying from someone who takes their shop seriously. Whether you actually want to sell on your site or not, you have complete control over how your products are displayed on your own website. There’s only so much you can do to make your Etsy shop different. But, if you have your own website with product pages, the sky’s the limit! You can have as many images as you want, add how-to videos, use your brand colors and fonts, and really make it unique to your business. 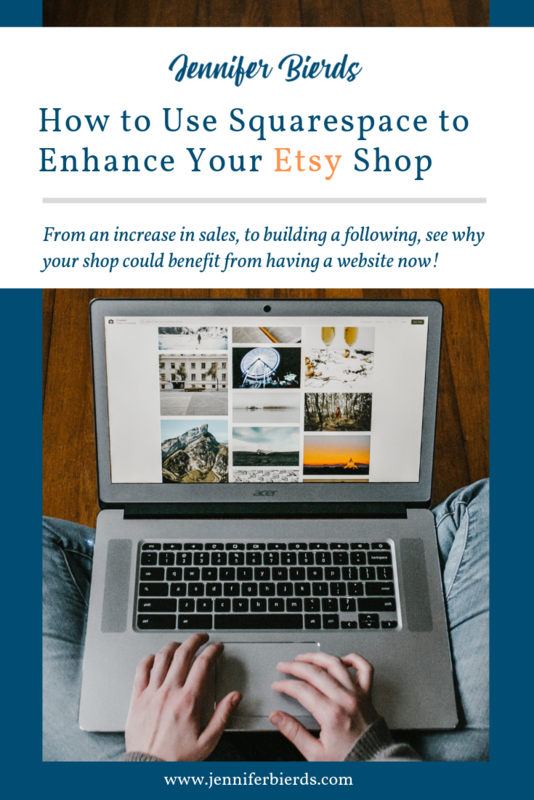 If you choose not to sell directly through your website at first, you can still have a “buy now” button that links to the Etsy shop. You know how I mentioned spending all of my time posting to social media, and not knowing what it was that was producing results? Squarespace has built-in analytics that tell you exactly where your visitors are coming from. So, if you’re spending time on Facebook, Pinterest, and Instagram, but see an overwhelming majority of visitors coming from Pinterest, then you know that you should be spending your time there. By having access to this kind of valuable data, you can see what’s working, and stop wasting time on what isn’t. Another benefit of having analytics on Squarespace is that you can connect Google Analytics, and see what keywords people are searching for when they come upon your site. These keywords will prove valuable in using them on Etsy as well in your product titles and descriptions. Having the right keywords on your website and on Etsy can do wonders for your SEO and, as a result, your product sales. A completely free tool for generating website traffic - beyond using social media for marketing - is your website blog. Having a blog to complement your Etsy shop gives you an opportunity to build a following for your brand. Blogging with Squarespace is super easy, and doing so consistently can really increase your views. Once visitors land on your website to read your blog post, you have an opportunity to convert them into buyers by directing them to your shop. Attracting people to your business’s own website through marketing and blogging lets you build a relationship with them. Doing so connects your customers to your brand, and increases the likelihood that they’ll buy from you again in the future. One way to strengthen that connection is by offering a regular newsletter. That newsletter can give you customers updates about your shop, highlight your latest blog posts, or offer seasonal promotions. No matter the content, seeing your shop name on a regular basis in their inbox is a surefire way to remind your customers about your products. Even more so, Squarespace gives you multiple ways to offer a newsletter to your visitors, including promotional pop-ups or strategically placed newsletter blocks throughout your site. Finally, simply having a “contact us” page on your website can be welcome feature for some visitors. Etsy requires that people either Sign In or Register in order to contact a seller, which can be a turnoff for some. With a contact form, all anyone needs is an email address. As someone who’s sent many custom order messages back and forth, I can attest that there’s something nice about the simplicity of sending direct emails instead. If you eventually decide to sell from your own website instead of paying Etsy fees, Squarespace makes this easy for you, too. Squarespace has a built in function to import your Etsy products, so you’re not having to add products one-by-one. When the time comes, they have complete step-by-step instructions on their website to walk you through. That alone is a great reason to start with Squarespace for your shop! 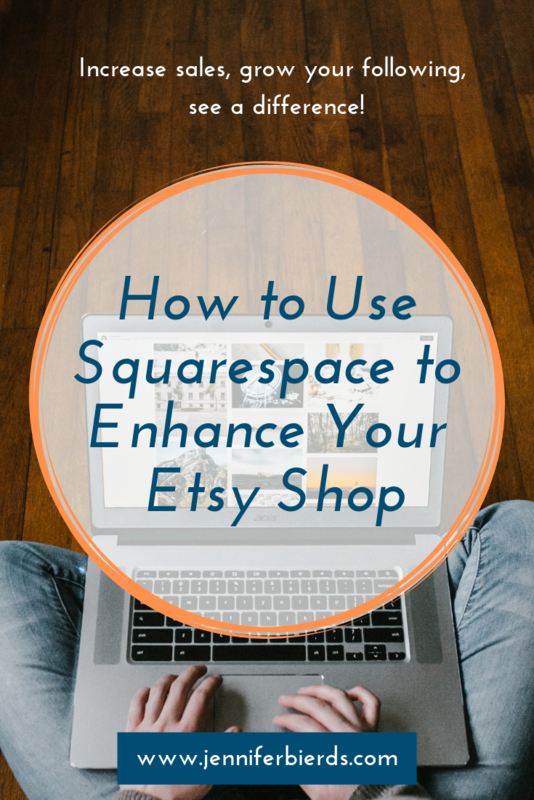 As you can see, there are many perks to having a custom Squarespace website to enhance your Etsy shop. Even if you don’t start by selling through your site, the benefits of building a professional online presence for you shop are many. And when you do make the change to e-commerce, Squarespace makes it super easy! If you’re interested in a custom Squarespace site for your Etsy shop, I’d love to talk with you! I’m passionate about helping small business owners, and I want to see the “little guy” succeed. 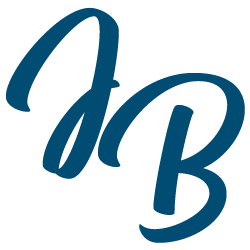 Go ahead and book a call with me here, or click through below to see what’s possible! PS - Mention that you found me through this post and receive 15% off your website design!